Preston North End Football Club (often shortened to PNE) is a professional football club in Preston, Lancashire, whose team currently plays in the EFL Championship, the second tier of the English football league system. Originally a cricket club, Preston have been based at Deepdale since 1875. The club first took up football in 1878 as a winter fitness activity and decided to focus on it in May 1880, when the football club was officially founded. Deepdale is now football's oldest ground in terms of continuous use by a major league club. Preston North End was a founder member of the Football League in 1888. In the 1888–89 season, the team won both the inaugural league championship and the FA Cup, the latter without conceding a goal. They were the first team to achieve the "Double" in English football and, as they were unbeaten in all matches, are remembered as "The Invincibles". Preston won the league championship again in 1889–90 but their only major success since then has been their 1938 FA Cup Final victory over Huddersfield Town. The club's most famous players have been Tom Finney and Bill Shankly, who are both commemorated at Deepdale by stands named after them. Other notable players include Tommy Docherty, Alan Kelly Sr. and Graham Alexander. Until 1961, Preston were usually members of the First Division but, having been relegated after the 1960–61 season, they have not yet returned to the top flight. They were first relegated to the Third Division after the 1969–70 season and have spent 28 of the 49 seasons since 1970 in the bottom two divisions, including a span of 19 seasons from 1981–82 to 1999–2000. Preston have faced serious financial issues and were twice in danger of closure. The club is now owned by businessman Trevor Hemmings and has been established in the EFL Championship since gaining promotion in 2015. Chart showing the progress of Preston North End F.C. through the English football league system. Preston North End was founded in 1863, originally as a cricket club, and played their first matches at the Marsh near the River Ribble in the Preston suburb of Ashton. Later that year, they switching to Moor Park in the north of the town, calling themselves "North End" in recognition of the new location. On 21 January 1875, the club leased a field opposite Moor Park on the site of the current Deepdale stadium, which has been its home ever since. The club formed a rugby union team in 1877 as a winter fitness activity but this was not a success and, a year later, they played their first game under the rules of association football. In May 1880, a proposal to fully adopt the association code was unanimously accepted and Preston North End Football Club was officially founded. Preston became one of the first professional clubs by hiring players from Scotland. In 1887, they beat Hyde 26–0 in the first round of the FA Cup, still a record winning margin in English first-class football. Scottish forward Jimmy Ross scored eight goals in the match before going on to score 19 goals in the competition that season, also still a record. They played Hibernian F.C. in 1887 World Championship losing 2-1 in Edinburgh. 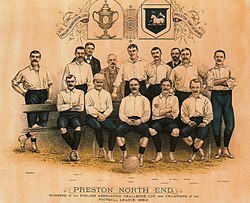 In 1888–89, Preston became the first league champions and the first winners of "The Double", becoming the only team to date to go throughout an entire season unbeaten in both the league and FA Cup – winning the FA Cup without conceding a goal. In a contribution to Paul Agnew's 1989 biography of Tom Finney, the player himself wrote: "The club has long been known as Proud Preston, and the Old Invincibles of the previous century set some incredible standards". The author wrote elsewhere: "...and that team became immortalised as the 'Old Invincibles'". Other sources call the team "The Invincibles" and both versions of the nickname have been used. In his autobiography, Finney wrote: "The championship stayed with North End — by now tagged the Old Invincibles — the following year, but runners-up spot had to suffice for the next three seasons". As Finney said, Preston were league champions again in 1889–90, but have not won the title since. In total, they have been league runners-up six times, including the three consecutive seasons from 1890–91 to 1892–93, and twice in the 1950s when Finney was playing. The club's last major trophy win was in the 1938 FA Cup Final when they defeated Huddersfield Town 1–0 and the team included Bill Shankly, Andy Beattie and goalscorer George Mutch. Preston's most famous player, Tom Finney, joined the club as a teenager in 1938. His first team debut was delayed until 1946 by the Second World War but he played for Preston until he retired in 1960. He was nicknamed the "Preston Plumber" because of his local business. Finney remains the club's top goalscorer, with 187 goals from 433 appearances, and also scored 30 international goals for England in 76 appearances. A year after Finney's retirement, Preston were relegated to the Second Division and have not played in the top division since. They had a memorable season in 1963–64 when, managed by former player Jimmy Milne, they finished third in the Second Division and reached the 1964 FA Cup Final where they lost a thrilling match 3–2 to West Ham United. Preston were first relegated to the Third Division after the 1969–70 season. Although they won promotion again immediately, the team have spent 28 of the 49 seasons since 1970 in the bottom two divisions, including a span of 19 seasons from 1981–82 to 1999–2000. The club experienced a near-terminal decline in the 1980s which brought about the very real threat of closure, the nadir being the 1985–86 season when they finished 23rd in the Fourth Division and had to seek re-election to the league. Under manager John McGrath, the team recovered and won promotion back to the Third Division only a year later but it was a false dawn as the team spent another three years in the bottom division from 1993 to 1996. The club finally began to recover and move forward after a takeover by heating manufacturer Baxi in 1994 but their ownership ended in June 2002. The team's central defender David Moyes, then aged 34, began his managerial career when appointed by the Baxi-controlled board in February 1998. Moyes was successful and managed the team to the third tier championship in 2000. Preston reached the 2001 play-off final but were defeated by Bolton Wanderers. In the 2005 play-off final, under Moyes' successor Billy Davies, Preston were beaten 1–0 by West Ham United. Following the Baxi sell-off and the departure of Moyes to Everton in 2002, the team was established at second tier level through the 2000s but more problems arose at the end of the decade with an HM Revenue and Customs winding-up order in 2010 and relegation to the third tier in 2011. The taxation issue was resolved by local businessman Trevor Hemmings, already a shareholder, who bought a controlling interest in June 2010. The team were promoted again, via the play-offs, in 2015 and have been well-placed in the EFL Championship since then. Deepdale was the original cricket club's home from 1875 and has been a football venue from 1878. It is the world's oldest football ground in terms of continuous use by a club in a major league. When Baxi took control, it embarked on an investment programme which had the main goal of upgrading Deepdale into a modern stadium. The old ground was demolished and rebuilt in four stages and the last of the new stands was opened in 2008. Part of the redevelopment was the original National Football Museum which opened at Deepdale in 2001, though it closed in 2010 due to funding issues and was relocated to Manchester in 2012. 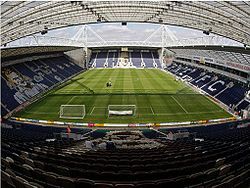 The site of the current Deepdale stadium was first leased by the club in 1875 and was first used for association football in 1878. The biggest attendance seen was 42,684 for a Division One clash with Arsenal in April 1938. Following a complete reconstruction between 1996 and 2009, the stadium has a seated capacity of 23,404. The current pitch dimensions are 110 x 75 yards. Outside the Sir Tom Finney Stand is a statue of the famous player himself, which is known as "The Splash" or the "Tom Finney Splash". The statue, sculpted by Peter Hodgkinson and unveiled in July 2004, was inspired by a famous photograph taken at the Chelsea versus PNE game in 1956, played at Stamford Bridge in particularly wet conditions. In 1996, Preston's Third Division title made them the third club to have been champions of all four professional leagues in English football. This feat has also been achieved by Wolverhampton Wanderers in 1988, local rivals Burnley in 1992, and both Sheffield United and Portsmouth in 2017. Historically, Preston North End's main rivalry has been with Blackpool and the West Lancashire derby between the two clubs has been contested across all four divisions of the Football League since 1901. Preston's local rivals in the league in recent years have included Burnley, Blackburn Rovers, Bolton Wanderers and Wigan Athletic. The previously affiliated women's football team was called Preston North End W.F.C. In May 2016, they became Fylde Ladies F.C., in association with National League North side A.F.C. Fylde. ^ a b "Preston North End FC History". Preston North End. 2018. Retrieved 25 August 2018. ^ "FA Cup Heroes". The Football Association. Retrieved 10 July 2013. ^ In 2003–04, Arsenal also achieved an unbeaten season in the top flight, but they went out of the FA Cup at the semi-final stage. ^ "Remembering when Preston were The Invincibles". Bolton News. 15 June 2001. Retrieved 19 August 2018. ^ Finney, Tom (2003). Tom Finney – My Autobiography. London: Headline Publishing. p. 113. ISBN 0-7553-1106-X. ^ "Results & Matches on Saturday, 30 Apr 1938". Racing Post. 2018. Retrieved 20 August 2018. ^ Finney, My Autobiography, pp. 415–419. ^ "Col backed Baxi's PNE revolution". Lancashire Evening Post. 8 February 2014. Retrieved 8 August 2018. ^ "Baxi in PNE sell-off". Lancashire Evening Post. 28 June 2002. Retrieved 8 August 2018. ^ "West Ham 1–0 Preston". BBC Sport. 30 May 2005. Retrieved 7 August 2018. ^ "Deal agreed for Preston North End takeover". BBC Sport. 4 June 2010. Retrieved 6 August 2018. ^ Airey, Tom (6 July 2012). "Why football museum moved to Manchester". BBC News. Retrieved 24 August 2018. ^ a b "Deepdale – Preston North End". Football Ground Guide (FGG). 2018. Retrieved 19 August 2018. ^ "Preston North End – First Team Squad". Preston North End F.C. 2018. Retrieved 10 August 2018. ^ "First Team Management". PNEFC. ^ "List of Preston North End F.C. Managers". Preston North End. Archived from the original on 22 July 2012. Retrieved 19 May 2012. ^ "Preston Manager History – Past & Present – Soccer Base". ^ a b c d Up until 1992, the top division of English football was the Football League First Division; since then, it has been the Premier League. Similarly until 1992, the Second Division was the second tier of league football, when it became the First Division, and is now known as The Championship. The third tier was the Third Division until 1992, and is now known as League One. ^ a b c d "Milestones". Preston North End FC. 3 January 2008. Archived from the original on 7 March 2009. Retrieved 22 November 2011. ^ "Brad Potts:Midfielder Brad Potts Joins Preston in a Club Record Deal for North End". Yorkshire Post. 3 January 2018. Retrieved 4 January 2018. ^ "Jordan Hugill: West Ham sign Preston striker in reported £10m deal". BBC Sport. 31 January 2018. Retrieved 31 January 2018. ^ "Zibaka Breaks North End Record". League Football Education. 14 September 2011. Retrieved 27 November 2011. ^ "Age is just a number – Graham Alexander". BBC Sport. 10 October 2011. Retrieved 27 November 2011. ^ "Rivalry uncovered! The results of the largest ever survey into club rivalries" (PDF). The Football Fans Census. December 2003. Archived from the original (PDF) on 4 March 2009. Retrieved 27 November 2007. ^ "Preston North End – Sponsors Through the Years". Historicalkits.co.uk. 2018. Retrieved 19 August 2018. ^ "PNE women's team have fresh start as Fylde Ladies". Blackpool Gazette. 25 May 2016. Retrieved 2 June 2016.